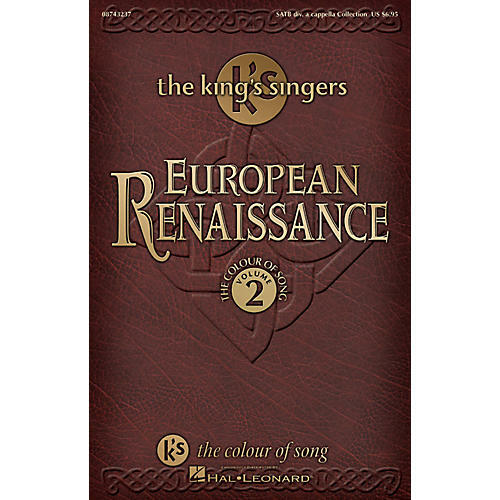 Here are 12 of the King's Singers favorite works of the European Renaissance in their own performing editions. Includes performance notes and translations for each work. Spanish: Otro tal misacantano (Anonymous), Dindirin, dindirin (Anonymous); French: Triste depart (Nicolas Gombert), La, la, la, je ne l'ose dire (Pierre Certon), Au joli jeu du pousse avant (Clement Janequin); German: Tanzen und Springen (Hans Leo Hassler), Innsbruck, ich muss dich lassen (Heinrich Isaac); Italian: Parmi di star (Severin Cornet), Il bianco e dolce cigno (Jacques Arcadelt), Chi chilichi (Orlande de Lassus); English: Hark All Ye Lovely Saints (Thomas Weelkes), I Love, Alas, I Love Thee (Thomas Morley).